Fr. 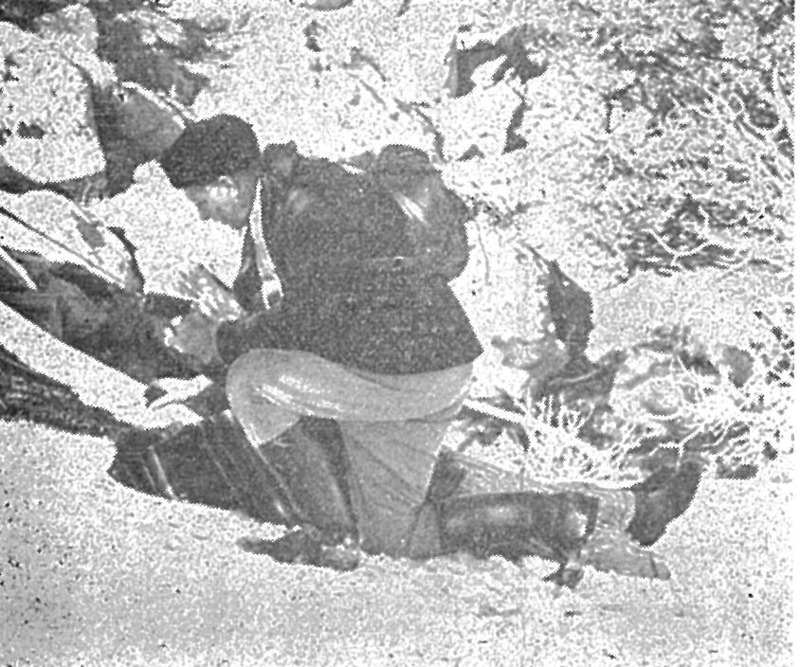 Meyer anoints the Navajo woman. From past experience I knew at once what that meant: Yellowhair’s wife was either dying or was already dead, for when a Navaho senses the approach of death the patient is carried from the home to some isolated spot and left there to die. Were a person to die in the hogan the dwelling would have to be destroyed by fire to drive away the evil spirits. Knowing of their superstition, I proceeded to the spot where Mrs. Yellowhair had been laid. “Come along,” I called to old man Yellowhair, but he refused to come. He seemed aware of the fact that his wife had already passed away. These primitive people will not look upon a dead person because they believe that the evil spirit enters the corpse immediately after death. If the survivors should come in contact with the dead body the evil spirit would enter into them and kill them instantly. Alone, I approached the body only to find that life had just left her. I anointed her and said the prayers for the dying. I came back to the family who were grouped by a small camp fire and told them the news. It is hard to record the pitiful sounds that the bereaved ones make when they give vent to their grief. It is not a wailing, it is not a sobbing noise, but rather a subdued, mournful crying. “Father, will you bury her?” I had expected this, for often the Navahos have the missionary baptize their dying not only that their dead may receive a Christian burial, but also to assure themselves of having nothing to do with the dead. Since the body becomes the Temple of the Holy Ghost after receiving the Sacrament of Baptism, the Missionary, not wishing to see it desecrated by pagan beliefs, digs the grave and inters the body. If the corpse is left to the Indians, they will not touch it, but will merely pile stones around and over it – thus possibly leaving it to be devoured by the coyotes. In order to prevent such a desecration to the body of Mrs. Yellowhair, I dug the grave, buried her, and said the prayers for the dead. All this time the surviving relatives looked on from a short distance without lending a helping hand. Fr. 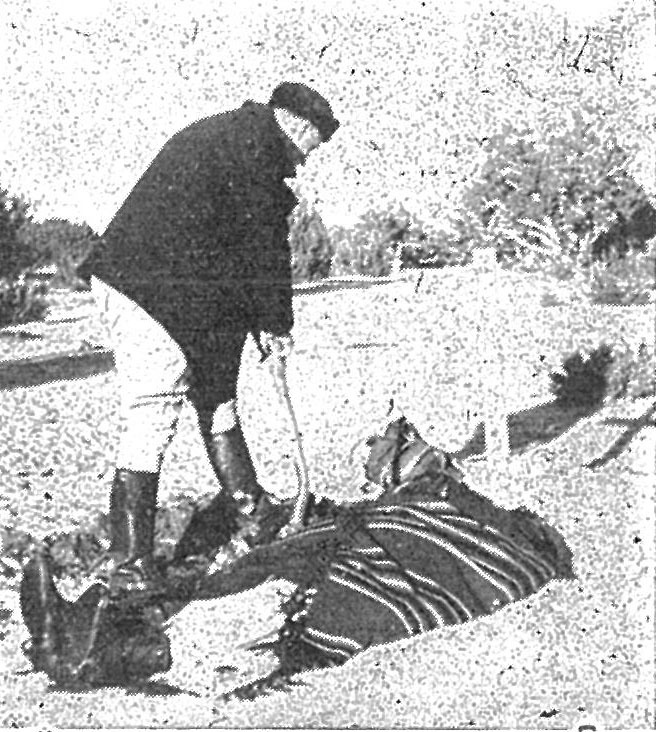 Meyer buries the Navajo woman. There was an elderly priest – Fr. Thomas Connolly stationed at Tucson. He could not stand the Tucson heat in the summer, he was unable to perspire. Fr. Winfrid invited him to spend the summer with us – Fr. Connolly was no trouble at all. Fr. Connolly was so appreciative of our hospitality and insisted we visit him in Tucson for Thanksgiving. Fr. Winfrid must have thought we needed a little vacation – so Fr. Winfrid, his parents, and I went to Tucson. Fr. Connolly’s housekeeper/cook was not Catholic but had been working for Fr. Connolly for several years – he preferred a non-Catholic. He was afraid Catholic cooks might talk too much. The nerve. Catholic cooks do not talk any more than non-Catholic cooks. Before Sunday Mass, Fr. Francis had been in the Sanctuary blessing some religious articles. He returned to the Sacristy – too late he realized he had left the holy water and sprinkle on the main altar. He told one of the altar bogs (a Navajo) “Go and get the sprinkler from there,” pointing at the altar. The boy was puzzled – he did not understand Father (Fr. Francis was a nervous person). He pointed and in an excited voice repeated his request. Finally, the server thought he understood. He goes to the main altar, picks up the holy water and sprinkler, and proceeds down the middle aisle. and sprinkles everybody, as he had seen Father do many times for the Asperges. Last December there was a little baby, named Juanita, living at Low Mountain. She doesn’t live there any more. It was Wednesday, December 22. I had come from the Piñon Government Boarding School, where we had had a Christmas party in the afternoon for about 100 Navajo kiddies who attend our religious instruction classes. I pulled up at the Whippoorwwill Day School, a little one-room quonset hut affair near Low Mountain, where the teacher was having her Christmas program that evening. She has an accordion and had asked me to accompany the children’s singing. The program started after dark – about 6:30. The little room, about the size of a large living room, was filled to capacity; the children, about 20 of them, were at one end, Navajo men and women along the side and rear walls, many of the women sitting on the floor. First, two Government educational men from area headquarters, Chinle, were scheduled to speak to the pupils and their parents with Henry, my interpreter, repeating their words in Navajo. 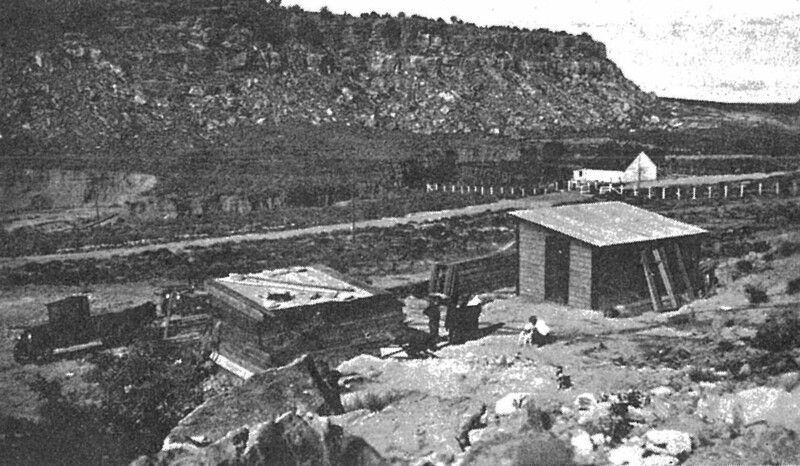 As soon as the first gentleman had finished his talk about the fine work of the school which had been erected only a few months before, a Navajo sitting along the side wall began to speak with Henry – something about a baby, the hospital, and the priest (pointing to me) – but I could not get the full conversation. The time he spoke of was back in November. I had stopped at the hogan on a casual visit that day, and noticed that little Juanita was very sick. When I told the folks that the child should be taken to the hospital, they promptly accepted my invitation to come to Keams Canyon with me. Sure enough, the doctor diagnosed the ailment as the “closest thing to pneumonia”. Medical care soon brought Juanita back to health; I saw her at home a few days later and look like a million dollars. Now the father wanted me to take them to the hospital again. I had Henry ask him it he could wait a little while – till after the program. “No,” he said excitedly, “baby very, awful sick; maybe she’s dying”, I asked the teacher to excuse me and remarked that no doubt the children would make out very well “a capella”. The father and I went outside and got into the Jeep. “Where is the baby?” I asked, “at home?” “No,” he replied, “up there,” as he gestured with a characteristic pucker of the lips. We drove out into the black night for about a quarter of a mile. “Stop here,” my companion said. “Stop here?” I wondered to myself. I saw no hogan; in fact I didn’t see anything.The Indian got out of the Jeep and started walking; I followed. A flickering fire finally appeared in the distance and at once I knew that the situation was grave. We came up to the fire which was in the middle of a small circle of piled-up cedar branches – a quickly constructed wind-break in the wide open spaces. Beside the fire stood the Indian’s wife, a young, frightened girl of 20, and his mother; on the ground lay a cradleboard covered with blankets. When a Navajo is dying or near death, the family usually moves him out of the hogan so that he will not die there. This is done in order to evade the necessity of abandoning or destroying the hogan, because according to a strongly held traditional belief, when death occurs within its walls, a hogan becomes contaminated and is forever jinxed. I stooped to look at little Juanita, her eyes were half closed and bleary; she was breathing with difficulty. “Yes,” I urged the parents, “we better hurry; perhaps we can get to the hospital in time.” When we returned to the school the program was well under way and we could hear the children singing. I went inside to call Henry and had him tell the parents that the baptism was absolutely necessary for heaven, and that I wished to baptize Juanita before we went on. “Okay,” was their willing response, and Juanita became a child of God. We stopped at the hogan for a few things and then headed for Keams Canyon as fast as we could safely go. It took us a little over an hour to get there. I went into the hospital first, the father and mother with little Juanita following. It was after 8:00 o’clock. Lorna, the young Hopi nurse, asked what she could do for us. “Well,” I said, “we have a very sick baby here; I hope it is still alive.” She felt its cheek; I felt it too – very cold. It hurt me to see the young mother trying gently to shake it awake; but she didn’t try very long; we hadn’t made it in time. Little Juanita had died along the way. We left the body there and arranged to take care of the burial next day. Lorna informed us that since the baby had not died in the hospital, there would be much red tape to go through to have a box made and a grave dug, and suggested that I call the carpenter in the morning; the father himself agreed to dig the grave. As we arrived at the mission, the father was crying softly; not a sound from the mother. They stayed in our little stone house which is always open to visitors. Next morning at 8:00 o’clock I called the Government carpenter shop and they promised to make the box right away. Then I took the father to the cemetery where he began digging the grave. About a half hour later I picked up the box, and the mother and I drove back to the cemetery. After the father was finished with the grave we went to the hospital. The sorrowing parents washed the little body, wrapped it up in blankets and placed it in the box. The hospital requested information for a death certificate: Baby’s name: Juanita Buckinghorse’s Son #1; age about 9 months; born at home; father: Buckinghorse’s Son #1; age about 50; mother: Rosita Yellowhorse; age: 20; other children: 2. Then the funeral; it was a very simple and quiet affair: only the parents and the priest, who said the Prayers. Three curious youngsters looked on from a distance. The father covered the grave and left the cradleboard and a small blanket alongside the little mound. It was December 23. Our Lord was coming again in 2 days; but little Juanita could not wait. She went on ahead to meet him. Hopi people at St. Joseph Mission. Hopi, as most Indians, perceive time in a cyclic present. The sense of the past and the future are NOW. In the Hopi, for hundreds of years , there has been a deep, a broad and a living prejudice against anything Catholic as well as a proud tenacity for the traditional. The work these past two years of pre-Evangelization has been to draw the Hopi to recognize God’s proclamation already present. Basically, my presence, which is an invitation to follow the way of Jesus Christ. All I have, what little it is comes from God so that the people I go to do not see me but the God who sent me. More and more I am in awe of the responsibility to be the face of Jesus for a people. One of the principles of mission is dialogue. I approach this not only through daily conversations, but primarily in my manner of acting, my attitude in the spirit of Our Lady which must guide my conduct. These become real while being a chauffeur, driving 100 miles to the doctor with a cancer patient, and finally taking her to her last stay in the hospital, making sure of a Priest and burial. Driving a few parishioners to Sunday Mass and other Church activities. For example to Bishop Pelotte’s Ordination. And to a house warming for him. Anything to expose them. Christine was in the Offertory at Bishop’s Mass, and so was Neilson. They represented the Hopi. Beth, the other catholic young women provided the gifts. Also bringing a few non-Christians to Parish activities. There is a need for more Church activities as opportunities for sharing at the human level. I’ve participated often in daily life activities of the Hopi such as harvest festival, rejoicing in Mother Earth’s sustenance. Spending the day with other women preparing grapes for jam; or at yard sales; sharing hospitality and sharing at table. With the distances between villages I give lifts often, giving me the chance to meet and exchange with youths, men just out of jail, artists and others. Listening and talking with them along the way. It is they who are God’s sign posts. One must slow down in order to win the race. In my Father’s Providence; I have received much this year from my Hopi neighbors. Last winter the water pipes were frozen for a month and a half. We had to wait for a natural thaw to make repairs. I was offered shower facilities in four homes, laundry facilities in another’s house. Going in daily to draw water. Just a few years back this was totally unheard of. Asking a Catholic – an outsider in this much privacy. Christine is the other young woman. When Our Lady’s Society came to Hopi, Christine was three, she was nurtured in Christianity and at thirteen was Baptized and received Reconciliation and communion. Christine’s adoptive mother died. After a year she fell into a common pattern on the reservation, became pregnant and delivered a baby girl. With the consent of her non-Baptized father, I stood witness at the baby’s Baptism. Christine brings her baby to Mass on Sundays, and continues to struggle to finish High School. An old missionary house near Keams Canyon. The Tewa Tribe live on the Hopi reservation, literally next door. In many ways they are indistinguishable, yet they have retained their own language, there is inter-marriage, and the Tewa, after the Hopi have instituted the maternal line of descent. Both Hopi and Tewa Women are the important member of the family, making important decisions. Wilma is a Tewa, she is now the treasure of the Tribe. I have been instructing her in the teaching of Christ. Even though we’ve spent many hours in study the need for pre-evangelization is obvious. The concept of Sunday obligation is completely foreign, among other concepts. The Sacraments for one. I feel the need for a Native American Catechism. Wilma’s mother has objected strongly to interest in Catholicism and to attending Mass. Both her children have been Baptized. The oldest, six year old Bianca, has leukemia. Other activities: Taking communion to Nielson in the Hospital, 50 miles away, as well as offering them, he and His wife, communion in my chapel. I don’t have the Pastor’s permission to perform para- liturgical services. Communion was an exception due his illness. After a serious sprained ankle several people checked on me bringing small gifts. Throughout the year I received many small gifts of wild herb tea, corn, vegetables, fruit and honey. These are significant bricks off the wall. An elderly man, Raymond, drops in frequently. I asked him if he visited others? He said he came here because he felt wanted. These are the small steps on the way to truth. Beth, was Baptized two years ago, her father left the family because he didn’t want to live in the same house with a Catholic. Beth’s brother and sisters objected and pressured her for going to Mass on Sunday. My council was to stay home, pray and wait. After several months Beth was allowed to attend Mass. I’m continuing instructions with her. Her sisters warmed to me slowly. This past August they invited me to spend the day in their village and attend the Snake Dance. Some of the people feel non-Indians should not be permitted to see it. Beth and her sisters risked ridicule for inviting me there. Another experience with Beth has been witchcraft. The Hopi believe strongly in witches and their power. Beth, had a pain she thought to be ulcers. The Doctors told her it wasn’t, but didn’t know what it was. She went to a Medicine Man who “pulled” a deer skin out of her side. This she felt was very bad. The Medicine Man told her a woman and a man were witching her. I prayed over her and taught her the prayer to St. Michael. Beth’s young niece has expressed interest in being a Catholic like her aunt. Living in the desert is to live simply with dependence on the Father. Spiritually and practically, His divine providence is a daily experience. Financially I live well within the poverty of Jesus and Mary. The providence of the Father and in the gift of our life in the Spirit. The village of Old Oraibi is the oldest inhabited village in the United States. The Spanish Missionaries established a mission there in the 17th century under the patronage of St. Michael. Since the revolt of 1680, the destruction of the village church and death of the missioner, the catholic Church has not been we1come. In December I was asked by a woman to help them, the community of Old Oraibi to celebrate Christmas. We had a small program of carols, the Christmas story, gifts of fruit, candy and toys. Procuring them was my work. I was next asked to sponsor a sewing club. The women make quilts for their own home use and as gifts to newborns. I begged cloth and continue to do so. On one occasion I was asked to lead them in singing. I sang “Praise to the Holy Trinity”, no one joined, but listened carefully. I was asked, “who is the Trinity?” The following week it was “who is the Holy Eucharist”? Finally they have asked me to explain the bible, “as we don’t know anything about it.” The very small step of Christmas celebration became the large step of Mass. For this I took the opportunity of Fr. Jim’s visit this past July. Mass was celebrated by Fr. Jim Flanagan, with Deacon Jim Brady in Old Oraibi after three hundred years, on July 23, 1988. Fr. Jim was sensitive to the culture and simplicity of the people as well as the fact they are non-christians. Although the congregation is still small, St. Joseph church serves as an important and vital link in a large area. In 1997 the Vincentian Community of the Province of the West accepted Bishop Donald Pelotte’s invitation to minister to Navajo and Hopi Catholics in the northwest corner of the Diocese. On June 1, 1997, the current pastor, Fr. Clayton Kilburn, CM, became pastor of St. Joseph Mission. On July 2, 1997 the church was threatened by a BIA control fire that wind caused to get out of control and sweep down the canyon from the back of the boarding school to Beaver Dam. Father Clay fought the fire for three hours losing only a number of trees, along with the roof and items stored in the “Navajo Hotel”. 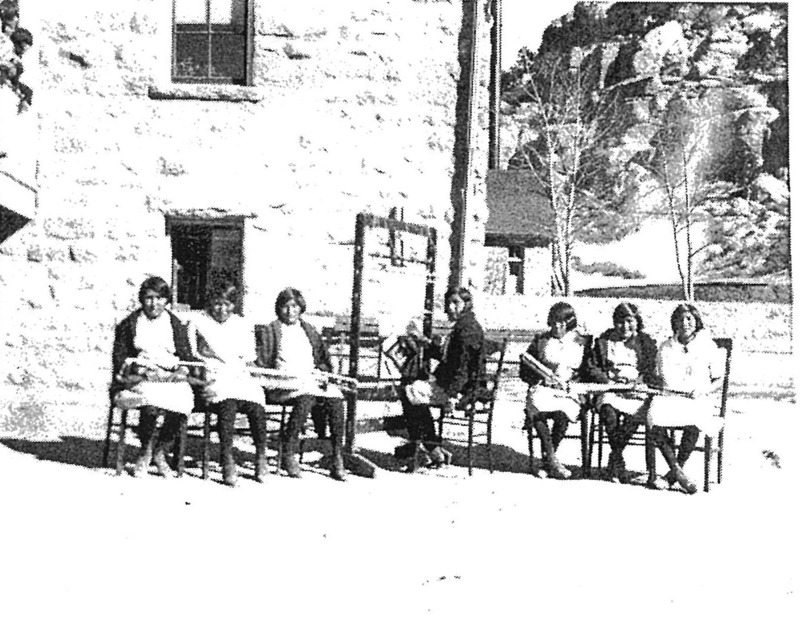 The “Navajo Hotel” provided lodging for many relatives bringing children to the school or patients to the hospital when mules and wagons were still the means of transportation. It has now been restored. The Parish Hall bearing evidence that the tire was licking up the back walls along with the church and the cottage were saved by Fr. Clay’s efforts and a few who stopped to help. On June 13, 2000, Bishop Donald Pelotte, at the invitation of Chairman Wayne Taylor, attended a meeting of about 30 Hopi from different villages and expressed to them his sincere sorrow for any contribution the Catholic Church or any of its members may have had to the painful history shared by the Catholic Church and the Hopi. Meaningful dialogue followed during which some concerns still remaining were expressed. Bishop Wall blesses the people at Keams Canyon. 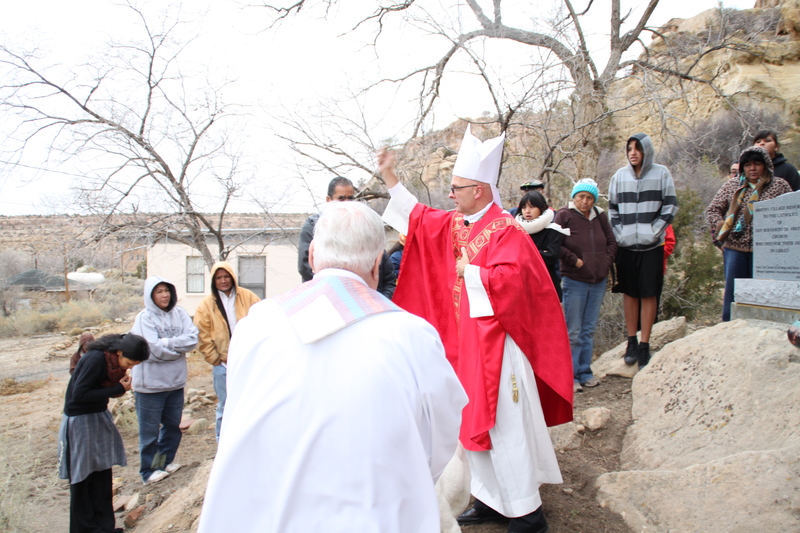 In 2013, Bishop James Wall blessed a monument erected in memory of the Hopi martyrs. He too apologized for any wrongdoings by Catholics towards the Hopi people, and expressed his admiration of the tribe and their culture. These gestures, along with the dedication shown by Fr. Kilburn to the Hopi people every day, will hopefully serve to foster a spirit of friendship and respect between the Catholic Church and the Hopi tribe in the years to come.